This month sees the return of Brighton Festival, a three-week cultural feast, featuring music, theatre, comedy and more than the city’s usual share of jugglers no doubt. It’s a very high-profile event – Burmese activist Aung San Suu Kyi is the festival’s Guest Director this year, and she has recorded an inspiring message for the festival website, all about creativity and freedom of expression. 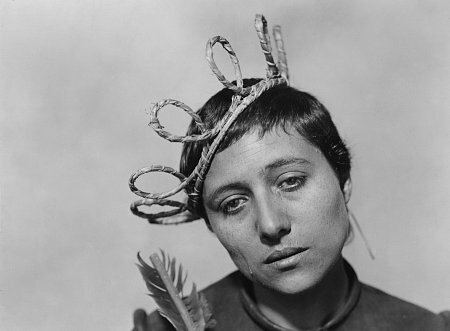 Therefore I am very pleased to say that early cinema is among the artforms represented at the seaside festival, most notably by a screening of Dreyer’s The Passion of Joan of Arc, accompanied by Adrian Utley and Will Gregory’s compelling new score. I was fortunate enough to see (and hear) this last week in London and it really is a tour de force, so please do attend the screening on 29 May at the Concert Hall if you can. Details here. A sniggerfest of artistic fluffing material. A prurient look at Victorian erotica, plus further examples of the way in which Victorian gentlemen and ladies got their jollies. Definitely not for children. Details of both magic lantern shows can be found here. Elsewhere, on the Festival Fringe, David Watts will perform his The Silent Movie Experience on 15, 22 and 29 May, playing along to silent comedies at the Komedia Studio. Details here. Lady Pumpernickel and Miss Carrota interact with projected texts and images, using methods found in silent films. As in silent films the performers will suffer from the tragedies of love & attempt to escape bizarre and humorous accidents. At the end there is just one open question: Who is going to die? Asta Nielsen is Dead will be performed at 5.15pm on 7 May – more information here.